You know that saying that most things worth doing are difficult? 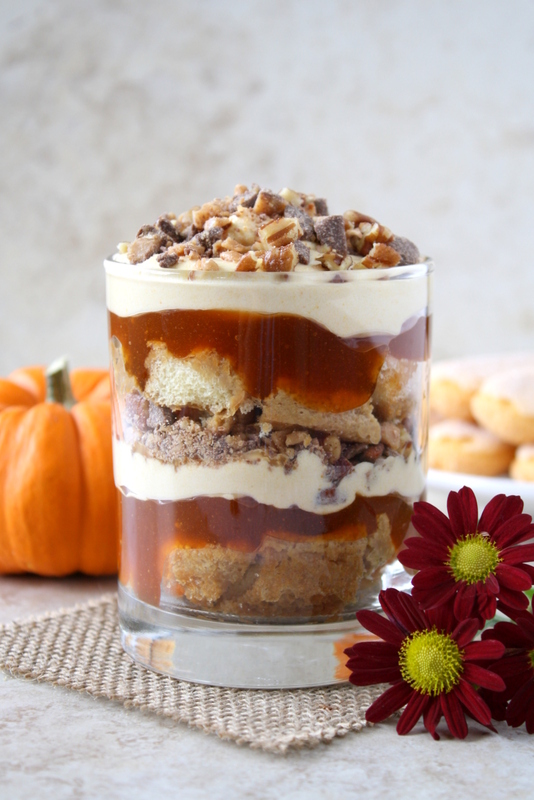 Well, that does not apply in the case of these pumpkin spice tiramisu parfaits—they’re super quick, no-bake, and no-cook. In a word, they’re no-fuss! Life has been incredibly busy lately—but then again, I feel like fall is the season of busy, wouldn’t you agree? The leisurely days of summer are past, and the cozy, cold months of winter are still to come; students are (hopefully) hunkering down into their studies, people are hard at work trying to make year-end deadlines, the holidays are coming, etc. After turning the calendar page to November the other day, I realized with a start that the complete draft of my PhD dissertation (i.e. the reason I keep repeating to myself that most things worth doing are difficult) is due in two and a half months, and of course, I’m behind on a dozen or more different wedding-related tasks (at least, according to The Knot…whose emails I unsubscribed from because they kept reminding me exactly how many days are left until the wedding). 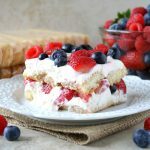 So basically, we all could use a simple and quick dessert recipe, because after all, stressed is desserts spelled backwards…which means that if we eat enough desserts, it will reverse our stress! I think that’s how that works, right…? 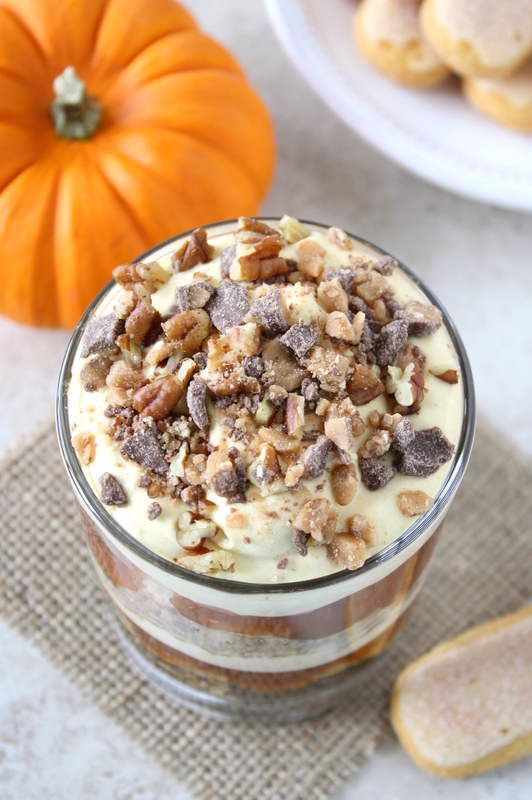 These pumpkin spice tiramisu parfaits are named for the fact that instead of dipping the ladyfingers in coffee, as we would for traditional tiramisu, here we’re using a pumpkin spice latte! Tiramisu has undergone a total fall makeover for this recipe. In addition to the ladyfingers dipped in a pumpkin spice latte, there’s butterscotch pudding (a word to the wise: maybe skip the store-brand version, since that’s what yielded the reddish, semi-translucent goo you see in my photos), a mixture of whipped cream, cream cheese, and pumpkin puree, plus toffee bits and chopped pecans on top! 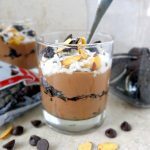 While you do need to set out the cream cheese ahead of time so that it can warm to room temperature, once that’s good to go, these parfaits come together in about fifteen minutes! If you want, you can also make them in advance (either assembled or with the components separated) and keep them in the fridge. I left an assembled parfait in the fridge for three or four days, and it was still quite delightful by the time I got around to eating it. Which season do you think is the busiest? How are you feeling about the end of 2017 drawing near? Using a mixer, beat the cream cheese and pumpkin puree until smooth. Add the heavy cream, powdered sugar, vanilla, and cinnamon or pumpkin pie spice (if using), and beat until smooth and peaks form. Prepare the butterscotch pudding mix according to the directions on the package. Place the pumpkin spice latte in a shallow dish or bowl. Holding a ladyfinger horizontally, dip one half of it quickly (less than 1 second) into the liquid. Repeat with the remaining ladyfingers, and then cut or tear each into 4 pieces. 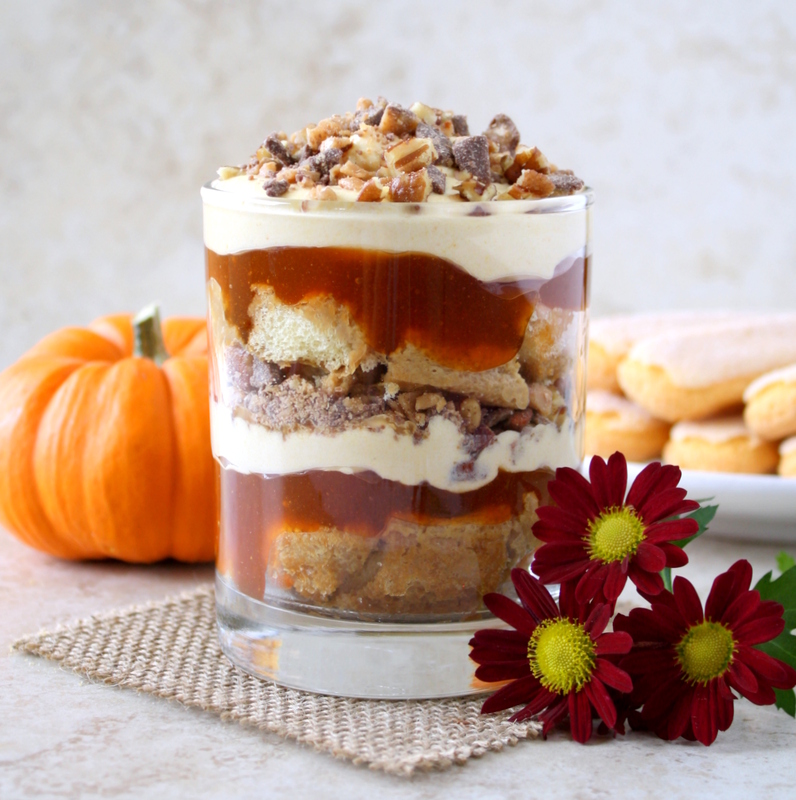 Assemble the parfaits: layer the ladyfingers (about 8 pieces, from 2 ladyfingers) in the bottom of each glass, add a large dollop of butterscotch pudding and a large dollop pumpkin whipped cream, sprinkle toffee pieces and pecans on top. Repeat this step to make two-layered parfaits (see note). Refrigerate until ready to serve. Makes about 4-5 parfaits (in 4-inch tall glasses). 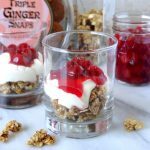 These are quite rich, so you may find it preferable to make more parfaits in smaller glasses or to only have one layer of each ingredient. 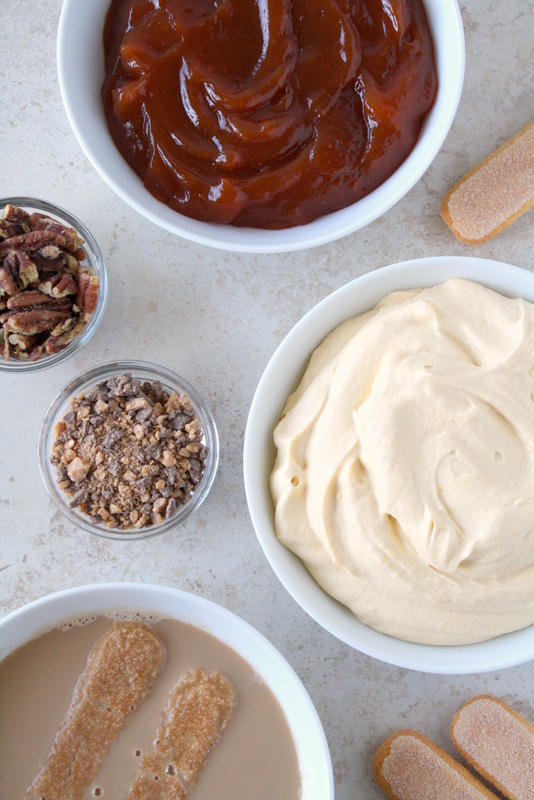 The pumpkin whipped cream is quite tasty without the addition of cinnamon or pumpkin pie spice, but I recommend adding one if you can! I listed it as optional because I only thought to add it after I had already photographed the parfaits. I’m sharing this post at Recipe of the Week and Fiesta Friday (cohosted by Life Diet Health and My Culinary Saga). Gracious me! I think this should be illegal…lol! I’m drooling Mara! Ha! Thanks, Debbie 🙂 I hope you get a chance to try these! I feel the same way. The clocks change and the holiday season madness begins. This looks like something worth slowing down for, though. Yum! Yes – I think you’re on to something! The fact that it gets darker earlier definitely contributes to the feeling of rushing around and being busier for me. I’m right there with ya! I do think that Fall is THE absolute busiest. Dessert has a way of making even the busiest months feel way more luxurious and manageable. ANd these parfaits look so scrumptious! I just love the PSL spin you put on these. If you have to hammer away at a dissertation, I’m glad you’re doing it with these close at hand!! You are not behind on wedding things. Unless the wedding is next week or next month, focus on your thesis. I had two months to write my PhD thesis since I had a job waiting and it is a LOT of work. So hunker down on that and eat all the comfort food 🙂 Love this spin for sure on the PSL. Thanks, Zainab! Luckily I’ve got a few months until the wedding, so I’m sure things will come together at some point or another. Wow, two months?! Talk about a total stressfest! This is so beautiful 🙂 Tiramisu is one of my fav desserts – combining with pumpkin puree and in parfait form is brilliant. Thanks for sharing this with Fiesta Friday. This looks heavenly! I love that you added toffee, my fav! I absolutely adore toffee, so adding it here was an easy choice 🙂 Thanks! 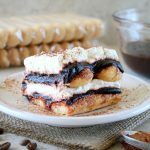 What a great twist on Tiramisu! This sounds really delish! Thanks for sharing, Mara and happy Fiesta Friday! I’m glad this caught your eye! Thanks, and I hope you had a great weekend! Wowzer. These are gorgeous, too! You do have a LOT going on, and congrats! Now does he love you coz you’re smart, gorgeous or because you can cook, lol? All of the above, I hope! You are too kind, Mollie! I think there’s another reason he fell for me – I came as a packaged deal with a very lovable puppy 😉 And that’s very cool that both of our pictures feature our dogs! I hadn’t noticed that similarity before.